Every story has a back story, its own unique set of circumstances that when examined answer the question as to why the original story is even happening. Back story is the reason a certain set of events are taking place, the motivation behind a specific person’s actions or behavior; the reason why. So if we wanted to learn, say, why Hamid Karzai would proverbially throw up the middle finger to the United States, his biggest ally, during what is likely to be his final address as an Afghan leader, the best course of action would be to take a look at the back story of who exactly this Hamid Karzai character is, and how he got to be standing up there giving that farewell speech in the first place. Like most politicians and world leaders, Hamid Karzai was born with a silver spoon to a wealthy family with well connected political ties. As such, he was afforded the opportunity to travel abroad and seek his master’s degree in international relations and political science, which he received in India in 1983. After graduation, he moved to Pakistan where he took up the anticommunist movement helping raise money for the mujahideen forces fighting the Soviets in Afghanistan. It was during this time that his siblings moved to the United States and he reportedly began contracting for the U.S Central Intelligence Agency. Following the withdraw of Soviet forces in 1989 and the subsequent collapse of the local communist government in 1992, Karzai took up a role in the fledging Islamic State of Afghanistan as the Deputy Foreign Minister, but was later arrested on allegations of spying for Gulbuddin Hekmatyar (the guy who took most of the credit for the post-Soviet, pre-Taliban violence in and around Kabul between 92-95). Of course, Karzai maintained that he was just trying to mediate between Hekmatyar and Prime Minister Burhanuddin Rabbani, but nonetheless, when Karzai escaped his detention, it was reportedly in a car provided by Hekmatyar, driven by one of his close associates. With continued chaos in Afghanistan and no clearly established central government presence, it was then that Karzai began meeting with what would become the future leaders of the Taliban and using the skills he learned fundraising for the CIA in order to organize their attempts at consolidating control of the country. Soon after, the ISI-backed and Saudi-funded Taliban were able to seize control of Kabul from the forces of what would become known as the Northern Alliance, and in return for his services and acknowledging his diplomatic potential, Karzai was offered the post of Ambassador of the newly-formed Islamic Emirate of Afghanistan. For his part, Karzai maintains that he never accepted the post, quoting his disdain for the Pakistani ISI and their influence over Afghan affairs, but oddly enough, journalist Roy Gutman discovered information in the U.S National Archives that suggests in December of 1996, the United States sent a diplomatic demarche to the ambassador-designee of Afghanistan, one Hamid Karzai, requesting the extradition of Osama Bin Laden, of all people. So while Karzai declares that he never accepted the post of ambassador for the Taliban government, the reality is that the United Nations never recognized the legitimacy of the Taliban and therefore would not accept their ambassador, and that when the US State Department did attempt to initiate diplomatic talks with the Taliban, they did so through Hamid Karzai. Regardless, in 1999, Karzai’s father was gunned down on his way home from a mosque, an assassination attributed to the Taliban, prompting Hamid to disavow his allegiance to the Islamic Emirate of Afghanistan and join Ahmed Massoud’s Northern Alliance, opposing his former collaborators. By 2000, Karzai was back on the world stage traveling to the U.S and Europe with Massoud warning the West of the growing threat from the Taliban and Al Qaida. Following the attacks on 9/11, Karzai was the quickest to jump on the bandwagon to overthrow the Taliban and drive Al Qaida out of Afghanistan. He fought alongside U.S Special Forces in October and November of 2001, and by June of 2002, had been appointed by the Afghan Loya Girga as the President of the Transitional Government of Afghanistan. So now that it’s been established how Karzai rose to power, let’s examine what he’s done as President of Afghanistan. Following his 2004 inauguration ceremony that was attended by no less than three former U.S Presidents and the current Vice President (at the time), Karzai set out to rebuild his country, however, what exact steps he took in order to accomplish that goal are murky, at best. His biggest challenge from the beginning, it appears, has been his own safety along with securing both sympathy and financial support from outside nations. After surviving no less than four assassination attempts, the majority of his time as President has been spent between hiding behind the walls of his presidential palace and lecturing the international community on how Afghanistan is the world’s biggest victim. While one of his half-brothers enriched himself in the poppy seed (aka heroin) industry, another brother oversaw the 2010 Kabul Bank Crisis, where the equivalent of over $900 million US dollars went unaccounted for. In what would become the world’s single largest (in relationship to national GDP) central bank collapse ever, the bank subsequently ended up getting bailed out by the taxpayers of Afghanistan, most of whom live on less than $50 a month. Furthermore, Karzai has been accused by international monitoring agencies of electoral fraud as well the recent allegations of back door communication with the Pakistani Taliban over future power shifts following a 2014 American withdraw. But none of that exactly answers the question, what exactly has Hamid Karzai done as President? What achievements has Afghanistan made under his tenure of leader? What developments have they made as a country? What exactly has Karzai done with over $100 billion of US treasure and the sacrifices of over 2,300 American servicemen? I have yet to find a definitive answer to that question. When I search for one, I find that Afghanistan ranks at the bottom of nearly every nation index out there, to include Transparency International’s Corruption Perceptions Index, where it shares the last place spot with none other than North Korea and Somalia. When I research the modern history of Afghanistan and Hamid Karzai, I find an opportunist who used whatever chance he could get to further his own personal agenda under the guise of national unity. I find a politician who claims to have no land or wealth, yet has a brother who squandered $151 million of Afghani treasury on real estate deals in Dubai and another who enriched himself though heroin. I find a leader who knows he’s played both sides for way too long, and realizes his gig is soon to be over. And when your time is up in Afghanistan, the norm is not to ride off into the political sunset. It’s to receive a hug from a man wearing a suicide vest. 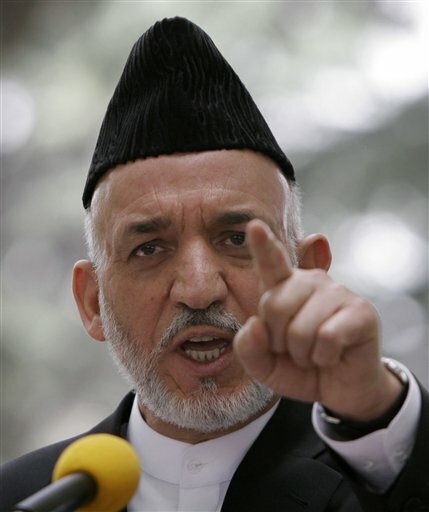 And that is why Hamid Karzai gave us the finger Tuesday during his farewell speech. He knows his time is up. He remembers the four assassination attempts on his life and the successful ones on those of his former colleagues. He knows that rusty, cold blade is waiting for him in some salty Taliban commander’s scabbard. And he’s scared. He thinks his best bet to play the other side, but I know that history would suggest otherwise. So farewell Hamid Karzai. Good riddance to you and yours. Hope you stashed some of those greenbacks that we pumped into your country away. You’re gonna need it, buddy. Like this article? Like us on Facebook!